I was very excited when I saw this recipe on The Cozy Apron because we are huge lovers of Baja fish tacos. 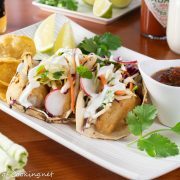 My husband first introduced them to me years ago and I fell in love with the combination of crispy fish with the crunchy slaw and the creamy sauce all on top of a charred corn tortilla. YUM! This recipe was really quite easy to throw together and fun to make. I first made the Baja sauce and the citrus vinaigrette to allow the flavors to mingle until I was ready to cook the tacos. I made the beer batter right before I fried the fish so the batter didn’t go flat and it really helped. 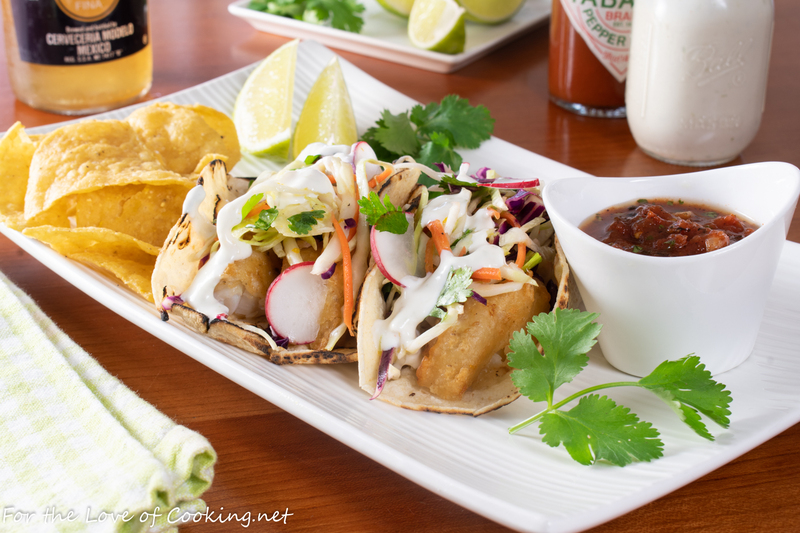 These baja fish tacos with citrus slaw were very delicious and my entire family enjoyed them. The fish had a nice seasoning and a terrific crunch while the crisp slaw was full of wonderful citrus flavor and paired nicely with the fish. I really loved the creamy baja sauce which is full of lime and garlic and was so tasty on top of everything. This recipe is a keeper. Make the creamy Baja sauce by combining the mayonnaise, sour cream, minced garlic, lime zest, lime juice, cayenne pepper, and salt to taste in a food processor; blend until creamy. Add some sriracha, to taste, if you’d like it extra spicy. Set aside to allow the flavors to mingle. Make the citrus slaw vinaigrette by combining the fresh squeezed olive oil orange juice, orange zest, lime juice, honey, and sea salt and freshly cracked pepper, to taste, together in a jar; whisk until well combined. Set aside to allow flavors to mingle. Toss the vinaigrette with the cabbage mixture and cilantro right before serving the tacos so the cabbage stays crisp. Make the fish tacos by adding your cod pieces to a bowl and season them evenly with the cumin coriander, garlic powder, cayenne pepper, and sea salt and freshly cracked pepper, to taste; set aside to marinate for a few minutes. Line a baking sheet with foil then place wire racks on top to hold the cod after frying. Add enough vegetable oil to a large deep skillet so it’s about 1-2 inches deep to shallow fry or use a deep pot with 3 cups of oil to deep fry. Heat the oil over heat over medium high heat until about 365 degrees. 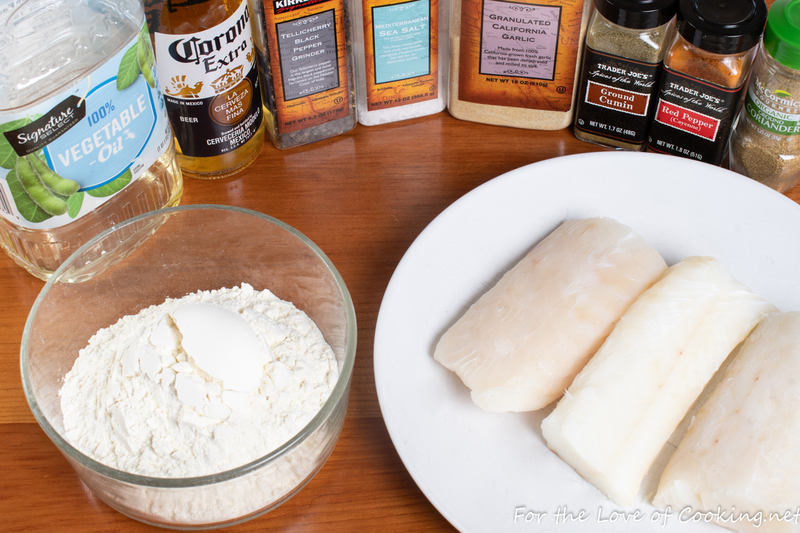 While the oil heats, season the flour with sea salt and freshly cracked pepper, to taste then slowly pour in the beer and whisk jut until smooth; once the oil is hot, dip the pieces of seasoned cod into the batter and place into the oil to fry in batches for about 2-3 minutes on each side for shallow frying or 3-4 minutes for the deep fry, or until cod pieces are golden brown and crispy. Set the fried fish on the prepared baking sheet and fry the remaining fish. To assemble the tacos, toss the slaw with the vinaigrette until well combined. Heat the corn tortillas over a gas flame for several seconds on each side (if possible) or in the microwave for a few seconds until pliable. 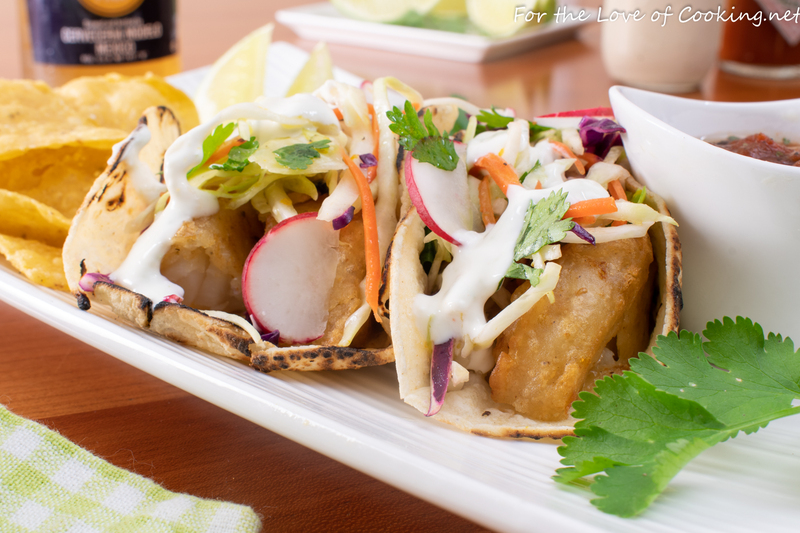 Add a few pieces of fried cod on the warm tortilla then top with slaw, radishes, and creamy Baja sauce. Serve immediately. Enjoy. Make the creamy Baja sauce by combining the mayonnaise, sour cream, minced garlic, lime zest, lime juice, cayenne pepper, and salt to taste in a food processor; blend until creamy. Add some sriracha, to taste, if you'd like it extra spicy. Set aside to allow the flavors to mingle. Make the citrus slaw vinaigrette by combining the fresh squeezed olive oil orange juice, orange zest, lime juice, honey, and sea salt and freshly cracked pepper, to taste, together in a jar; whisk until well combined. Set aside to allow flavors to mingle. Side Note: Toss the vinaigrette with the cabbage mixture and cilantro right before serving the tacos so the cabbage stays crisp. Add enough vegetable oil to a large deep skillet so it's about 1-2 inches deep to shallow fry or use a deep pot with 3 cups of oil to deep fry. Heat the oil over heat over medium high heat until about 365 degrees. While the oil heats, season the flour with sea salt and freshly cracked pepper, to taste then slowly pour in the beer and whisk jut until smooth. Once the oil is hot, dip the pieces of seasoned cod into the batter and place into the oil to fry in batches for about 2-3 minutes on each side for shallow frying or 3-4 minutes for the deep fry, or until cod pieces are golden brown and crispy. Set the fried fish on the prepared baking sheet and fry the remaining fish. 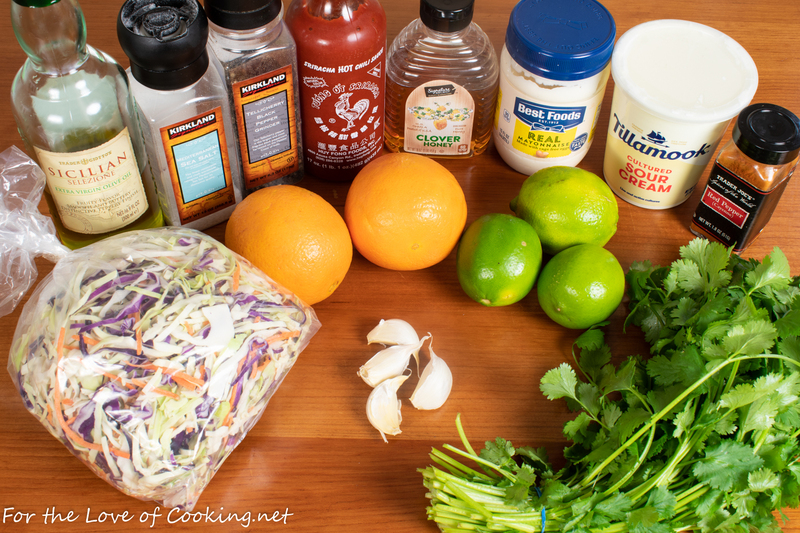 To assemble the tacos, toss the slaw with the vinaigrette until well combined. Heat the corn tortillas over a gas flame for several seconds on each side (if possible) or in the microwave wrapped in a moist towel for a few seconds until pliable. I’ve been thinking about fish tacos lately but have never had these. Yours look delicious and I like the spices that go into each part – will give them a try soon. My very favorite fish tacos. Love your slaw topping. Those look amazing! Totally worth tackling deep frying for.